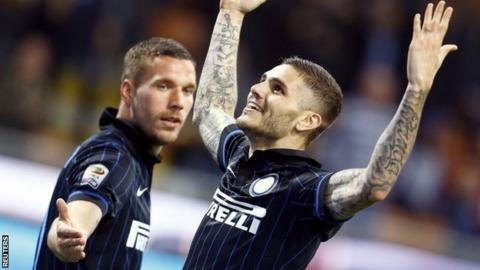 Inter Milan enhanced their Europa League hopes by beating third-placed Roma. Hernanes gave Inter the lead with a shot from the edge of the area and Roma's Víctor Ibarbo hit the post with a volley before Radja Nainggolan struck a fantastic first-time effort to level. But Mauro Icardi scored a late winner after being picked out by Arsenal loanee Lukas Podolski. Inter are up to seventh, overtaking AC Milan, who lost 2-1 to Udinese. Giampiero Pinzi scored for Udinese with a low shot and Emmanuel Badu tapped home Guilherme's cross. Giampaolo Pazzini scored a late consolation goal for Milan, who drop to 10th. Roberto Mancini's Inter are now just four points from sixth-spot and a place in the Europa League qualifiers. The result places some doubt on whether Roma will secure third position and with it, a Champions League play-off place. They are now only five points above fourth-placed Napoli, who have a game in hand. Match ends, Inter Milan 2, Roma 1. Second Half ends, Inter Milan 2, Roma 1. Corner, Inter Milan. Conceded by José Holebas. Radja Nainggolan (Roma) is shown the yellow card. Foul by Juan Iturbe (Roma). Rodrigo Palacio (Inter Milan) wins a free kick in the defensive half. Attempt missed. Rodrigo Palacio (Inter Milan) left footed shot from the centre of the box is close, but misses the top left corner. Assisted by Xherdan Shaqiri. Morgan De Sanctis (Roma) is shown the yellow card. Substitution, Roma. Seydou Doumbia replaces Daniele De Rossi. Goal! Inter Milan 2, Roma 1. Mauro Icardi (Inter Milan) right footed shot from the centre of the box to the centre of the goal. Assisted by Lukas Podolski. Substitution, Inter Milan. Lukas Podolski replaces Assane Demoya Gnoukouri. Daniele De Rossi (Roma) is shown the yellow card for a bad foul. Foul by Daniele De Rossi (Roma). Attempt missed. Mauro Icardi (Inter Milan) right footed shot from the centre of the box is too high. Assisted by Mateo Kovacic with a headed pass. Juan Iturbe (Roma) wins a free kick in the defensive half. Foul by Juan Jesus (Inter Milan). Attempt saved. Seydou Keita (Roma) left footed shot from outside the box is saved in the centre of the goal. Assisted by Alessandro Florenzi. José Holebas (Roma) wins a free kick in the defensive half. Foul by Xherdan Shaqiri (Inter Milan). Foul by José Holebas (Roma). Xherdan Shaqiri (Inter Milan) wins a free kick in the defensive half. Morgan De Sanctis (Roma) wins a free kick in the defensive half. Foul by Mauro Icardi (Inter Milan). Substitution, Inter Milan. Xherdan Shaqiri replaces Fredy Guarín. Substitution, Roma. Juan Iturbe replaces Miralem Pjanic. Assane Demoya Gnoukouri (Inter Milan) is shown the yellow card for a bad foul. Víctor Ibarbo (Roma) wins a free kick in the attacking half. Foul by Assane Demoya Gnoukouri (Inter Milan). Rodrigo Palacio (Inter Milan) wins a free kick on the right wing. Foul by Víctor Ibarbo (Roma). Danilo D'Ambrosio (Inter Milan) wins a free kick in the defensive half. Andrea Ranocchia (Inter Milan) is shown the yellow card for a bad foul. Víctor Ibarbo (Roma) wins a free kick in the defensive half. Foul by Andrea Ranocchia (Inter Milan). Offside, Inter Milan. Nemanja Vidic tries a through ball, but Rodrigo Palacio is caught offside. Substitution, Inter Milan. Mateo Kovacic replaces Marcelo Brozovic.